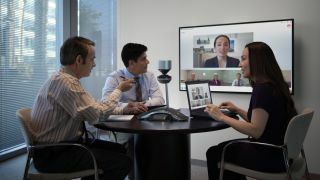 Polycom has launched a high-definition videoconferencing system with support for Microsoft Lync, aimed at increasing employee engagement and productivity. The CX8000 room system comes with a slew of features, including presence, contact search, instant messaging, virtual white boarding, touch display-powered presentations, application sharing, editing of shared documents and, of course, high-definition video and audio. Full integration with Microsoft Lync 2013 means that companies will be able to host multiparty videos with improved audio and video that uses open standards-based scalable video coding. Lync gives users a number of extra features, such as note taking, easy access from different devices, and Skype support. The CX8000 is also integrated with Microsoft Outlook. The new videoconferencing system also supports an optional 360-degree panoramic high-definition camera based on the Polycom CX5000 Unified Conference Station. This allows it to be placed in the centre of a table at a board meeting to capture everyone present locally, while communicating with people elsewhere. The video quality is 720p, but Polycom is awaiting qualification for a 1080p version. "Companies of all sizes recognize the need to break down the barrier of distance between dispersed teams of customers, partners and employees to harness the benefits of collaborating together in real time to solve everyday challenges. The Polycom CX8000 room system for Microsoft Lync meets this need with an intuitive and natural experience," said Ted Colton, Group VP of Strategic Alliances at Polycom. The CX8000 is available to order immediately and will ship in March.